When Abby Paffrath, the artist behind Art 4 All, approached Liquid Hardware founder Steve Kitto about a possible collaboration he didn’t have to think twice. Abby lives in Jackson Hole, Wyoming and creates incredible designs inspired by her surroundings. Her creations come to life using an ancient Indonesian technique called Batik, where patterns are drawn with wax-resist dyes. 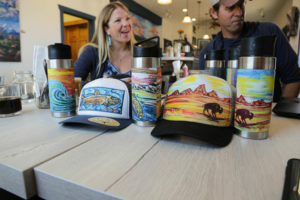 Abby then works with a graphic designer to print her art on hats, pins, stickers, and now, Liquid Hardware bottles and mugs. For the collaboration, Steve and Abby chose a piece called “Colorful Tontanka”. 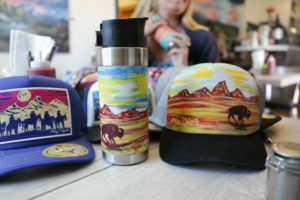 To transfer Abby’s art to the Liquid Hardware bottle, Steve used a process called hydrographic dipping which allows the print to be transferred to the bottle in an efficient, seamless fashion. The final product is simply stunning. The collaboration bottle can be purchased here with the choice between a coffee lid or water bottle lid and all will come with the internationally patented magnetic lid tether system which ensures that you Never Lose Your Lid™ on any adventure. Stay tuned for more fun patterns from Art 4 All and Liquid Hardware!